Often I yearn for a good note taking tool. It could be a to-do list tool but must be more feature rich in terms of managing projects and items that spans through several days. But it should not be too complicated to manage everyday minor issues. I have many little issues at work that need to be managed from 1 week to a month. And it is really difficult to maintain up-to-date status on those little issues. So I been using those little Post-It like note tool for a while , but then I found it hard to access easily. Then I changed to use the ‘Slickies’ Yahoo Widget . It’s a very simple note pad that can stick to the edge of the screen and it hides itself when the focus is lost and shows again when you click on it. It was very simple note taking tool but very easy to access whenever I need it! So I have been using it for 2 or 3 years. But the problem was that I had to run extra Yahoo Widget Engine just to run Slickies. Now everybody is using Google or Microsoft Desktop Widgets and Yahoo Widget is not being maintained properly. But then few days ago, I found this application ‘QuotePad’. It’s not a widget but an independent application. It behaves just like ‘Slickies’. It docks to the edge of the screen and hides itself when the mouse focus is lost. Perfect. Also you can add each note as separate items making easier to distinguish different issues. Also it provides Search and Alert(Reminder) functions. 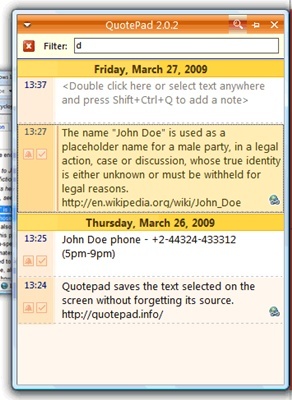 With multi-lingual support, fast and easy to access interface, and non intrusive behavior, I instantly fell in love with QuotePad. Still I am open for other good note taking tools, so let me know if you know any. I am very interested in trying other ones too. Thank you for visiting Hana & Sarah’s Freeware Blog! Are you getting tired of the constant MS Windows Update screen? Or You are not sure if you are running the latest bug patched version of MS Office suite? ‘Offline Update’ is the answer for you. It is an easy and convenient utility that will download all the necessary Windows and Office Update and install them at once. It supports multi languages and even you can make ISO disk image or copy it to the USB memory stick. First download the zip file and unzip it to a drive with enough hard disk space. For your information, my total downloaded file size was about 500MB. Then execute the ‘UpdateGenerator.exe’ . Below window will open. As you can see , you can select the target language and version of Windows and Office Suites , then click on the ‘Start’ button. It will start download all the required updates which have not been patched. Once the download is completed, a pop up window will be showing to alert the download is completed. All the update files are in fact stored in the ‘client’ subfolder. 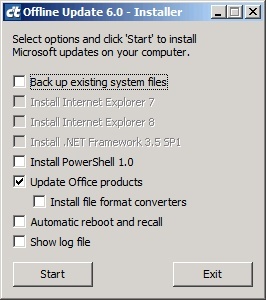 Please move into the ‘client’ and execute ‘UpdateInstaller.exe’ to initiate the actual installation process. I only tested with Office Suite and had 17 updates patched which took about 30 mins. For me, my machine was only rebooted once after all the updates were patched, but you might want to enable the ‘Automatic Reboot and Recall’ if you are updating Windows since Windows Updates often require rebooting per each update. Hana & Sarah's Freeware blog All rights reserved.